French subsidiary of the Belgian Recticel Group, RECTICEL INSULATION SAS, whose headquarters is located in Île-de-France (Gennevilliers, 92), is dedicated to the thermal insulation activity and specializing in rigid polyurethane foam panels. Present in France for over 40 years, it brings innovative solutions in line with expectations of building professionals and thermal regulations (RT 2012, BBC ...). With its know-how of over 40 years in the design and manufacture of thermal insulation board made of rigid polyurethane foam, RECTICEL INSULATION reveals L-MENTS®, a new generation of self-supporting and thermally isolated elements. Universal and standardized, suitable for a variety of pitched roofs on traditional structures. Individually or collectively, it adapts to the new, simple renovations or major. GAGE SERENITY, TO SAVE TIME AND ECONOMY! - Optimize the insulation of the roof, - Facilitate the implementation for artisans, - Provide a broad choice in the interior and exterior finishes, - To benefit the work of master savings. L-MENTS® combines the advantages of sandwich panels and seasoned boxes: a continuous thermal insulation and large spans between supports. Windproof, rainproof and compression, it has a lambda of 0.023 W / mK. The way forward is an effective response to the requirements of current regulations and future. She is also eligible for tax incentives: tax credits, CEE premiums and ECO-interest loan. - A dedicated website, www.l-ments.fr, Having the advantages of the use of the panel, particularly through an implementation of video. - In four levels of thickness (145; 160; 180 and 200 mm). Adapting to all regional architectures, L-MENTS® can receive any type of cover: tiles, slate, zinc .., respecting the DTU thereto. - To use twice as wide panels and thus cover more area with a single panel. Quick to implement, all easily fixed outside with screws through the RECTIFIX® contreliteaux fault in the frame. Already established on the panel, against the battens provide time savings during installation of the roof. Identifying integrated reinforcement facilitates the implementation of the ceiling. The combination and integration of highly insulated wooden stiffeners to PIR foam eliminates thermal bridges. This continuous insulation can be enhanced. Inside, the tape comes RECTITAPE® optimize the airtightness, and the underroof screen watertight outer side. ROOF WINDOWS: DOUBLE REINFORCEMENT, DOUBLE SECURITY! For those who wish to incorporate a roof window, a raised wooden frame outside distributes the forces on the neighboring panels. Inside, the lack of finish on the panel also installs a wooden frame attached to the integrated reinforcement and wood clearly marked on the inside. > A PRACTICAL PLEDGE FOR CARPENTERS AND drywall! The professional has a service space between the panel and the ceiling (later raised) to easily install electrical conduits for lighting, flat ducts for VMC, or to ask additional acoustic insulation. The subsequent installation of the ceiling multiplies the possibilities of decoration. It is also possible not to limit in lost roofs. A source of economy and serenity! In the case of conventional roofing panels, the finish is integrated even in hidden areas. For example, for the steep slope, the ceiling arises to a height of 2.50 m above the floor. 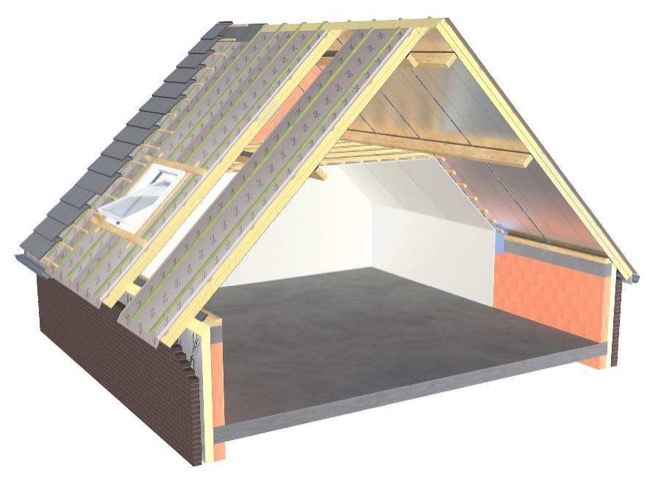 With L-MENTS®, only the insulation goes to the ridge. The retrofitted ceiling arises in conventional manner.